The federal government has announced a transit fund for coming years and given the impression that this is new money over and above whatever cities might receive today. It’s not, and folks like Mayor Tory who see this “fund” as a way to underwrite their pet projects like SmartTrack will come up short. The detailed budget paper shows where the transit money actually comes from (jump down to page 187 of the linked pdf), and includes the following chart. Gas tax: $21.8b. Toronto already receives about $150m annually from this source and has built the funding stream into its future capital spending projections. Existing infrastructure funding: $6b. This is self-explanatory, and is not new money. GST Rebate: $10.4b. This is another existing program, and it’s not really a payment to municipalities, merely a foregone source of federal revenue. 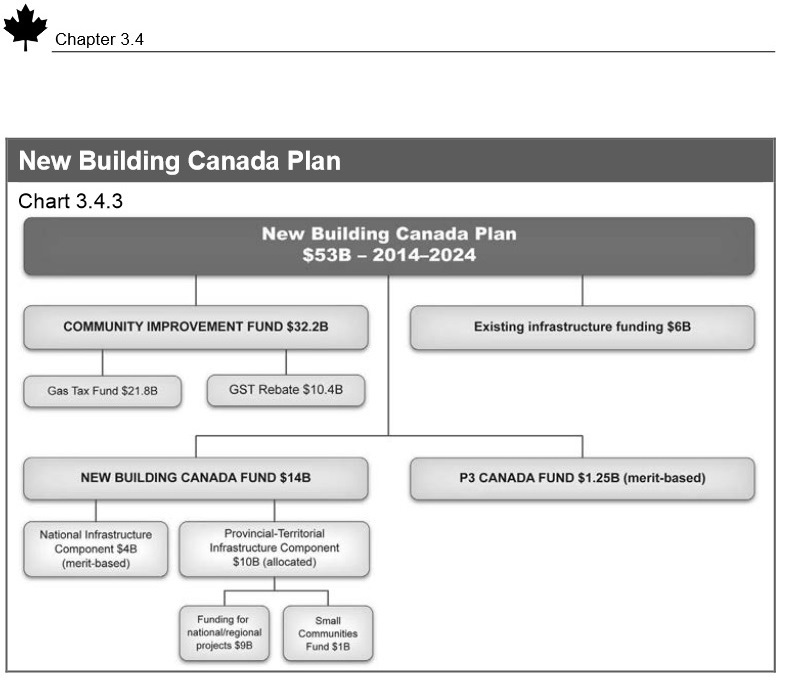 P3 Canada Fund: $1.25b. This is an existing program, although some of this may be new money. However, it is small change in the overall scheme of transit needs, and is subject to a “merit-based” allocation. The new “Public Transit Fund” is not a block grant program, but will be based on “merit”, a concept with which Toronto is all too familiar thanks to the machinations of various transit lobbies and politicians. Moreover, Ottawa looks to deliver projects through a combination of P3s and municipal financing backstopped by federal funding over the life of a project. This effectively defers the cash outlays to future years when a completed project would be paid for like a mortgage. This fund is expected to ramp up to $1b annually, but not immediately, and it is far from clear how much this would actually bring to Toronto or the GTHA. Whether the private sector actually has the capital and wishes to invest, let alone whether they could do so at a cost competitive with crown borrowing, is a question best not asked. As for municipalities, the borrowing would still be on their books and affect their debt ratios, even with “guaranteed” federal funding to pay this off. To what degree those future debt payments would crowd out net new spending would depend on prevailing economic conditions at the time. I am more than happy to see money flow from Ottawa to municipal projects, but the budget hype implies a much higher level of new spending than will actually occur. We are a long way from funding the many badly-needed transit projects in the GTHA, let alone seeing a reliable federal contribution on a par with provincial or local governments. The real problem is that the projects they will fund – really (ie with one time single point funding) will be those that buy votes. The vote effective transit disaster that will be the Yonge extension to Richmond HIll is likely to receive support, however, improvements on the balance of the Yonge line, or a DRL will not (as while it is very transit effective – is not vote effective). Steve you are bang on, there needs to be a large program, that has clear criteria – ones that you can have reasonable certainty while you design the project that you do or do not qualify for. Say BRT or LRT only applies – with certain road allowances, and a peak point/period projected ridership based on a known and accepted method of forecasting above 2k for BRT above 5k for LRT. Subway would qualify – only if ridership similarly determined were above say 12k and there is not available road space. Unfortunately the process would have to be exactly what the politicians do not want, predictable and apolitical. Oddly enough such a well defined program with even $3 billion/year in it would be enough to help keep everybody on the right path, as it would be an excuse to keep projects within the bounds of best practice, and would keep things moving forward on the straight and narrow. Having said that – this would be good governance, so it will not happen in my lifetime. What is the record number of times that the same money has been given out in different announcements while it is inferred that it is new money? P.T. Barnum would be proud of the federal Tories. Election after election, throughout the 1960s and 70s, provincial politicians in Oromocto, NB would say, “elect me and I’ll build the Burton bridge” (replacing a ferry across the Saint John River, south of Fredericton). It became a standing joke because once elected, nothing was done. Then a crazy thing happened, Someone actually built it. Promises are easy, but actions count. Now, is there a record for the number of times the money has been announced and never spent? I think that in the extreme case the difference would be 1; i.e. the one time it actually gt spent. Once that happens though you lose the opportunity to announce the spending. Robert – I think you understate the manner in which they can continue to talk about the “investments this government made”. Steve: Yes! Already we have had an announcement of the opening date for UPX, and we will certainly have some sort of event on that date, and it will be trotted out as an “achievement” for years to come. Andrea Horwath was critical yesterday because the UPX is a new service with diesel locomotives. However, there must be a break even passenger level when even a diesel train displaces enough cars that there is a net benefit to the environment. I don’t know what that number would be. Steve: You have to be careful with this type of calculation to ensure that you are looking at all day, round trip numbers. If demand is bidirectional, then every kilometer of operation “counts”. However, if the demand is unidirectional, then the reverse peak trips still are made, but with almost no passengers. The other point I would make in this equation, would be making the best use of dollars to have the largest possible impact (if what we are worried about is the environment). So what would the impact have been of instead of spending the money on the UPX you had instead instead spent it on improving the energy efficiency of the government buildings for instance, or had chosen to spend it on vehicle fleet improvements for say ministry of labour inspectors around Toronto, buying for argument sake a goodly number of Chevrolet Volts replacing the older Impalas etc. If you were focused on the UPX, in terms of as a good transportation investment, I think it would be evident that it was not even vaguely close to the best use of available resources. I do understand that electricity is better, has no on site pollution and accelerates faster leading to a shorter trip. However, I do not believe that the addition of diesel trains – if well patronised (which may not happen) is a net negative for the environment. Steve: There was also a lot of misleading info from the anti-diesel activists that undermined their credibility such as citing irrelevant scientific papers that described a very different type of engine and locale. But it made a good slogan. Yes, there is an awful willingness to undermine massive improvements in order to get what is perceived to be the ideal. There seems little concern with regards to accuracy, or the fact that trying to achieve a perfect solution, often means that nothing is done, or far too much is given up elsewhere. Imagine if we had said GO initially had to be electric or nothing, I suspect rather strongly it would have been nothing, and there would not be the very substantial GO service, that has continued to expand, and now looks very much like justifying electric very shortly. I would still prefer to see an intensification on some lines prior to going electric, simply to allow that money to have a bigger impact sooner. However, like insisting on a home run, batting for the fences is much more likely to result in a strike-out than an earned run — ultimately it is about reducing congesting and pollution, and that is about runs batted in (for the limited dollars available), that means best use of transit dollars to serve the most people, while having the greatest improvements in ride and largest reduction in emissions. PS. In the case of GO, we get a much larger reduction in emissions running diesel trains, for 2000 people at a time, than what the real alternatives were, bus or more likely cars. Federal funding? At this point that depends on the next election. And specifically on getting Harper out. This is far from the only issue where Harper has governed with smoke and mirrors; it’s really his M.O.